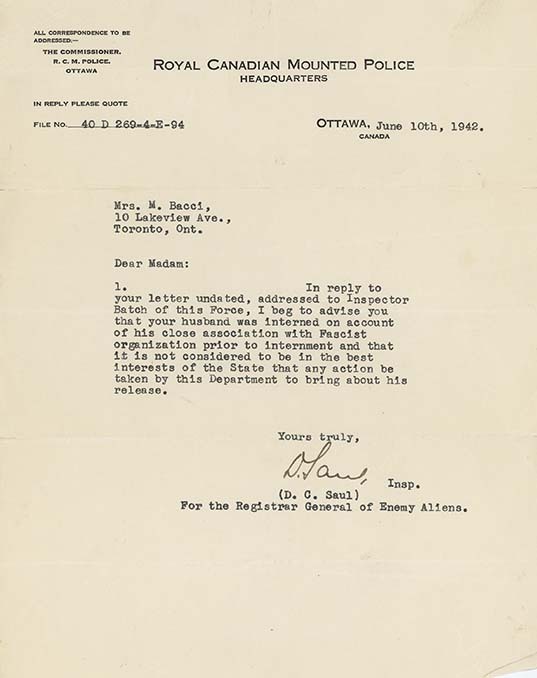 This typewritten letter from D.C. Saul, RCMP Inspector for the Registrar General of Enemy Aliens, was sent to Mrs. M. Bacci, on June 10, 1942 -- the second year anniversary date of her husband's arrest and internment. In the letter, the inspector provides an explanation to the wife of internee Ruggero Bacci regarding his internment. The reason for his arrest and detainment centre on his involvement with the Fascio Umberto Principe. As a result, it is not in the "best interests of the State" to have him released.